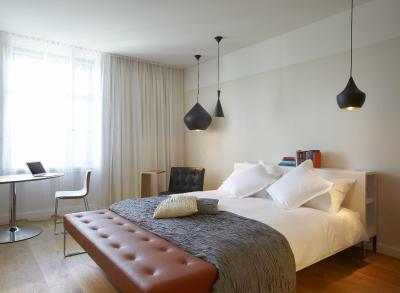 Lock in a great price for B2 Boutique Hotel + Spa – rated 9.1 by recent guests! Everything about this place is amazing: staff, amenities, rooms, experience, etc. I can not recommend it enough. Staying here was otherworldly, and the pictures on the site don’t do it enough justice. 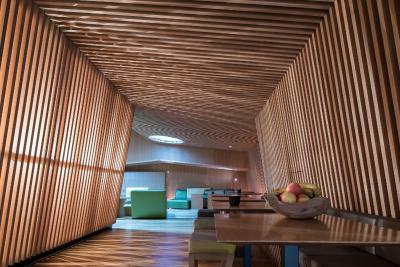 Staff, room design and comfort, lobby and all areas, really well done, modern, with taste, but easy! 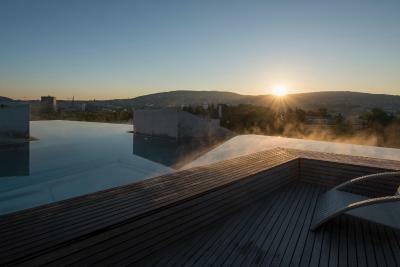 The roof top pool in winter is unreal. There is no way to describe it. The steam coming off the water playing in the lights, the jets that are lining the wall to pound out every ache or cramp (truly pound out, some are so strong they push you away from the wall). Explore every inch of the pools, sometimes you'll find a couple of jets you can't see that are great for your feet! And, they don't allow cell phones, a nice touch (we were in baths in Budapest with everyone on phones and having photoshoots). Truly a unique and wonderful experience. 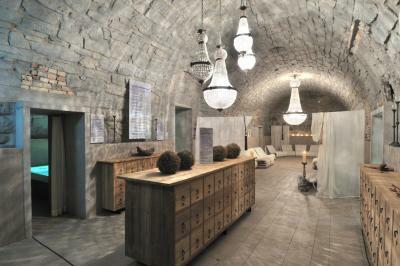 The spa in the basement is equally as impressive. It is well worth the money to have access for two days (35cf). We went 4 times. In 2 days. Breakfast was great, dinner was great, the room was current and very comfortable. There are plenty of transit options within moments. The staff were awesome. So friendly and helpful! The view of the sunset from the rooftop was incredible. Loved being away from the city and yet able to walk to it. The hotel is so beautiful and the staff is excellent! Everything was perfect!!! Super comfortable and relaxing. Definitely worth a stay for a night if you are looking to spend quite a bit of money but want to spend the night in a really nice hotel. The view from the rooftop pool is incredible too. 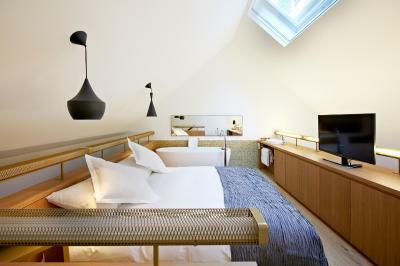 The modern and clean rooms made for a wonderful night of rest on our final night in Switzerland. Staff is very very nice and extremely attentive to guests. 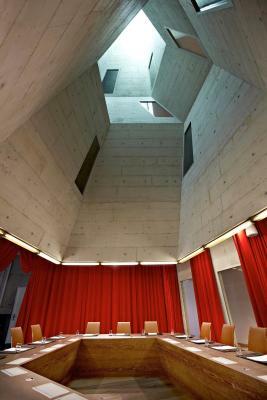 It was very cool to be in a modern hotel that was built inside an old brewery. The floor to ceiling bar and eating area very unique. The staff were exceptionally helpful. Easy walk into old Zurich and to the lake. 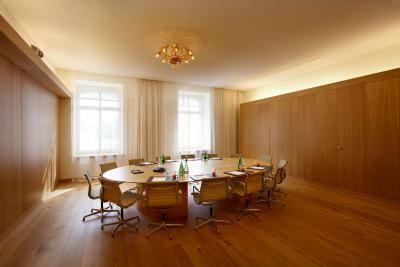 The room was very comfortable. 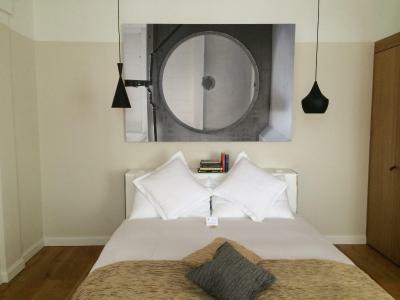 B2 Boutique Hotel + Spa This rating is a reflection of how the property compares to the industry standard when it comes to price, facilities and services available. It's based on a self-evaluation by the property. Use this rating to help choose your stay! 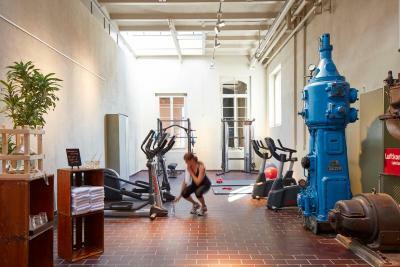 Next to Zurich’s center, B2 Boutique Hotel + Spa provides stylish, air-conditioned rooms in a former brewery. 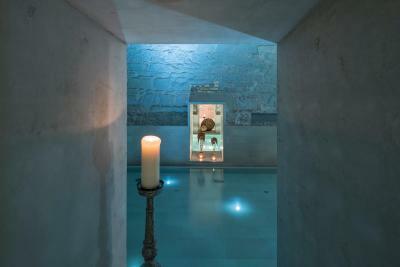 Guests can enjoy the wellness area, consisting of different swimming pools and a steam bath, at an additional charge. 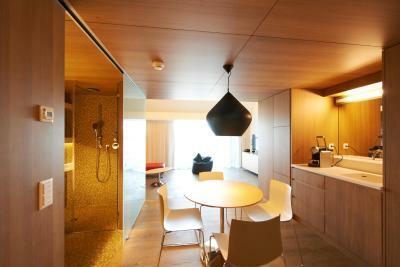 Each room features a flat-screen satellite TV and a bathroom with a bathrobe, slippers and a shower or a tub. Free use of the mini-bar is included in the room rate. Free WiFi is available in all areas. 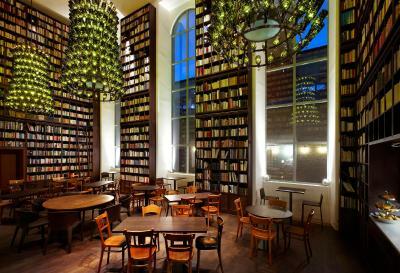 The boutique hotel houses its own private library with 33,000 books. Swiss tapas, cheese and a wide range of different wines is served at the on-site lounge. Guests can enjoy a freshly prepared breakfast each morning. 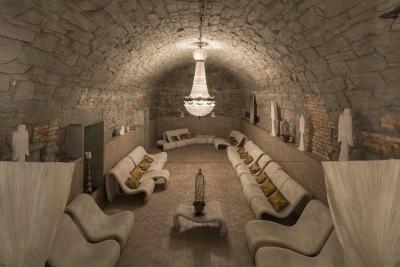 B2 Boutique Hotel + Spa comes with an elevator and a luggage storage room. The Zurich-Enge Train Station is just an 8-minute walk away and provides direct connections to the airport. The Hürlimannplatz Bus Stop (line 66) is 650 feet from the hotel, and the Enge/Bederstrasse Tram Stop (line 13) is a 7-minute walk away. 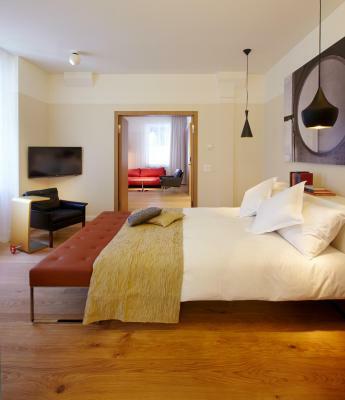 Enge is a great choice for travelers interested in shopping, lakes and cleanliness. 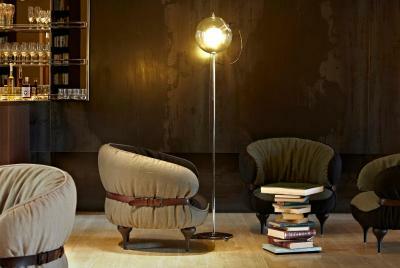 When would you like to stay at B2 Boutique Hotel + Spa? 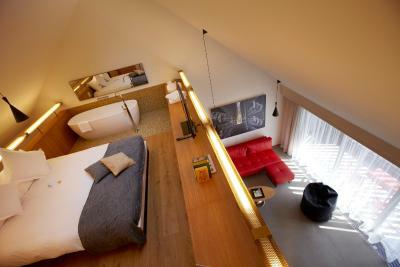 Stylish, air-conditioned room with wooden floors, a mini-bar, a flat-screen satellite TV and a bathroom with a shower. No extra beds and baby cots are available in these units. 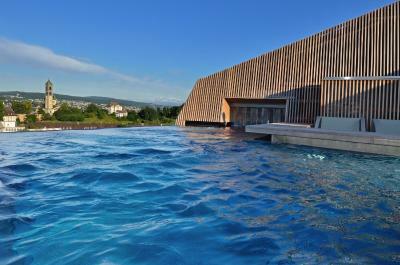 Entrance ticket to linked public thermal bath & spa available at 50% reduction. 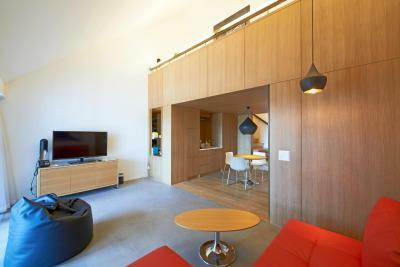 Air-conditioned room with a living area, a mini-bar, a flat-screen satellite TV and a bathroom with a shower or a tub. 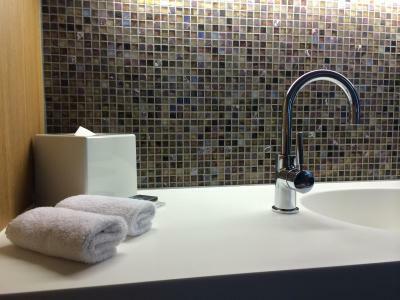 Air-conditioned suite with a living room, a mini-bar, a flat-screen satellite TV and a bathroom with a shower. 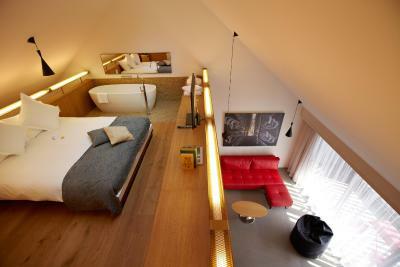 On the upper floor guests will find the bedroom and a large bathtub. 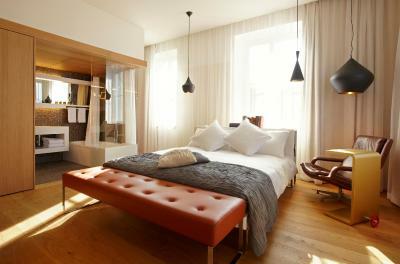 Stylish, air-conditioned room with wooden floors, a mini-bar, a flat-screen satellite TV, and a bathroom. This room is very spacious. 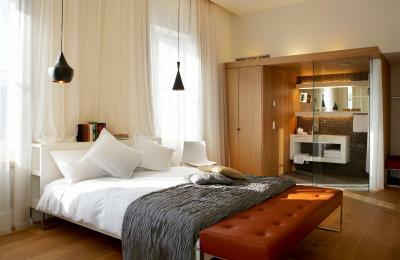 Air-conditioned suite with a living room, a mini-bar, a flat-screen TV and a bathroom with shower. There is an upper floor with a bedroom and a large bath tub. Hotel surroundings – This neighborhood is a great choice for travelers interested in shopping, lakes and cleanliness – Check location Great location - show map Guests loved walking around the neighborhood! 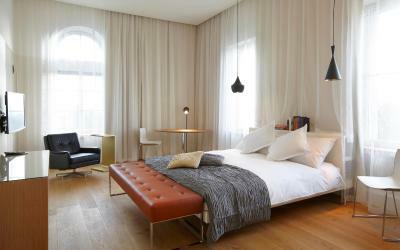 House Rules B2 Boutique Hotel + Spa takes special requests – add in the next step! B2 Boutique Hotel + Spa accepts these cards and reserves the right to temporarily hold an amount prior to arrival. 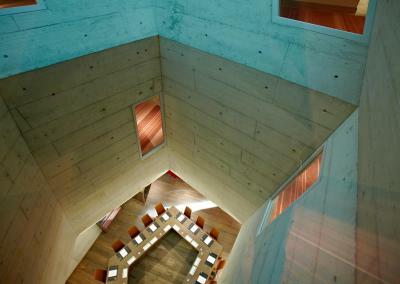 Please note, when arriving by public transport, that access to the hotel is on a slightly steep road or through a staircase from the Hürlimann-Areal. 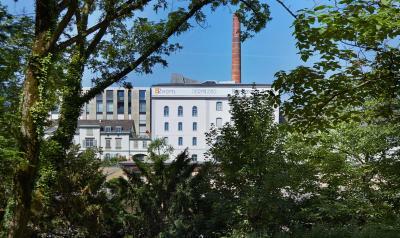 Guests can also walk 5 minutes from the station Zürich-Giesshübel and cross the river. There is a elevator or staircase that takes you to the rear of the hotel. Very well located, clean, quiet, great environment. The staff was grossly under qualified and were constantly giving us different information about questions we asked about. The english level of the staff in general was very poor and surprising for a 5 star hotel. We were also very disappointed by the menu selection available and the food quality at your restaurant. The organization for my spa treatments was a nightmare: I was lost and no one was able to clearly explain to me how to get there, how to proceed etc...On a general note, I found the price of the hotel very excessive for the poor quality of service and facilities we received. We were very disappointed and will not be returning. Breakfast is excellent but the overriding factor is the staff. They are so friendly, sensitive to traveller's needs and helpful that they make the stay a pleasure. The location is not ideal unless you came to visit Google as it’s right next to their office. We had to use Uber to go anywhere. 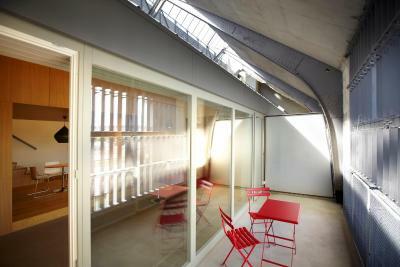 The rooms are a bit impractical - small and there is no privacy in a bathroom and shower. You have to pay extra to use the roof top jacuzzi and the spa. 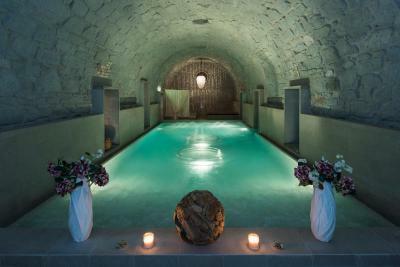 The best feature of this property is the spa. 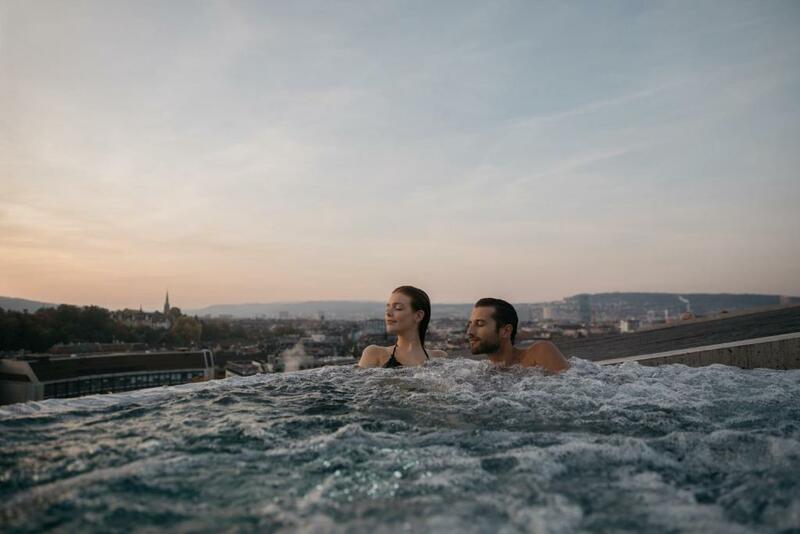 They have an awesome huge roof top jacuzzi overlooking Zurich and also a spa downstairs. Converted from an old brewery it makes the place look very unusual and cool. Breakfast was really great and the space is very stylish. it says hotel & Spa but although the spa is accessible directly from the hotel you have to pay. 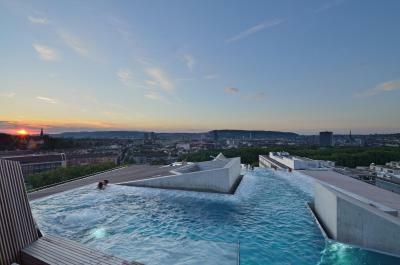 Breathtaking swim in the rooftop pool with fantastic view over the city. 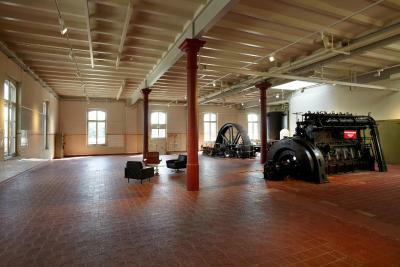 Great property, an old brewery turned into a boutique hotel. 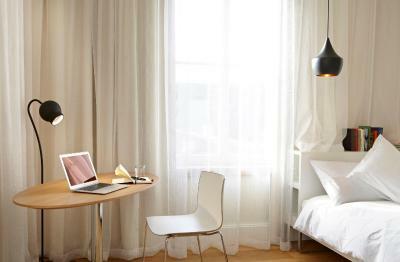 Very nice and comfortable room with all amenities you would expect. Free room bar with the local beer. I could not fault this hotel! I was in a suite. which was lovely. My friends had a hard time finding the room but other than that, it was all perfect! breakfast was nice. 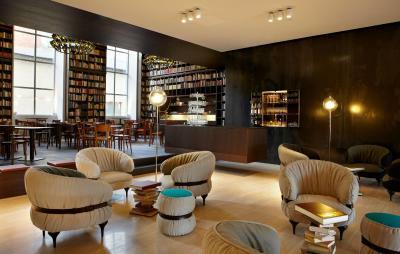 I loved the staff and the free mini bar! I was on a girls weekend away so we drank all the beers before going out and the staff even gave us a complimentary glass of fizz while we waited for our Uber! Amazing bar area and spa. 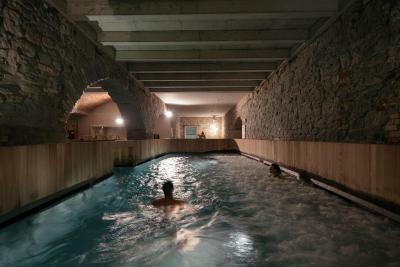 Le spa est absolument incroyable!!! Best place on earth! Breakfast service was erratic and mixup with the eggs order, but they apologized and gave us complimentary drinks voucher. Food in the evening not the best either - burger was nice but served with potato cubes that were clearly just bagged frozen supermarket stuff!